What is a griddle for? Cooking on a barbecue grill works great for most things. But if you want to cook, say, rice, eggs, veggies, or bacon… it can become a bit of a challenge. Try pancakes on a grill… no, actually, don’t do that. Stuff falls through the bars, which isn’t much fun. You could go back to your stove and cook that stuff on a frying pan. But an alternative is to put a well-designed pan right on the surface of your barbecue, thereby getting the best of both worlds. A flat ‘pan’ is called a griddle: mystery solved. And a really well designed griddle, as I discovered, is actually kind of fun. I felt, briefly at least, like a professional in a restaurant when I was using my griddle. Little Griddle is the name of an American manufacturer of good-quality skillets and griddles using ceramic and stainless steel. I came across them while Googling for barbecue griddles, and from the reviews it seemed like they had a good product. I then noticed that they were available through Amazon.ca: since I’m a Prime member, buying one was almost too easy. I ordered the GC-120 Professional series griddle, which is the ‘half size’ (14” x 16″) griddle. It occupies, as advertised, almost exactly half of my Weber E-330’s cooking area. The GC-120 griddle is a serious piece of gear. It weighs over ten pounds, and truly feels like it earns the ‘professional’ mark. 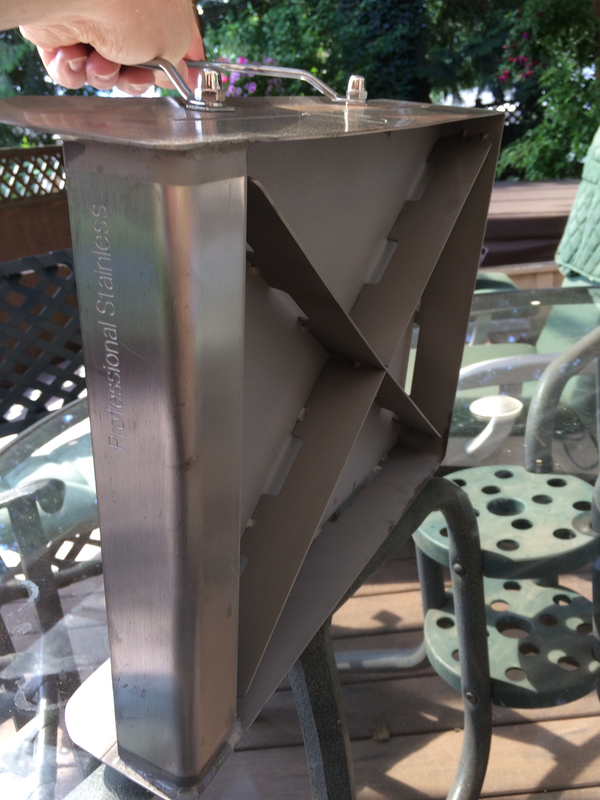 It has a full grease trough along the front, so it even looks like a professional grill in a restaurant. 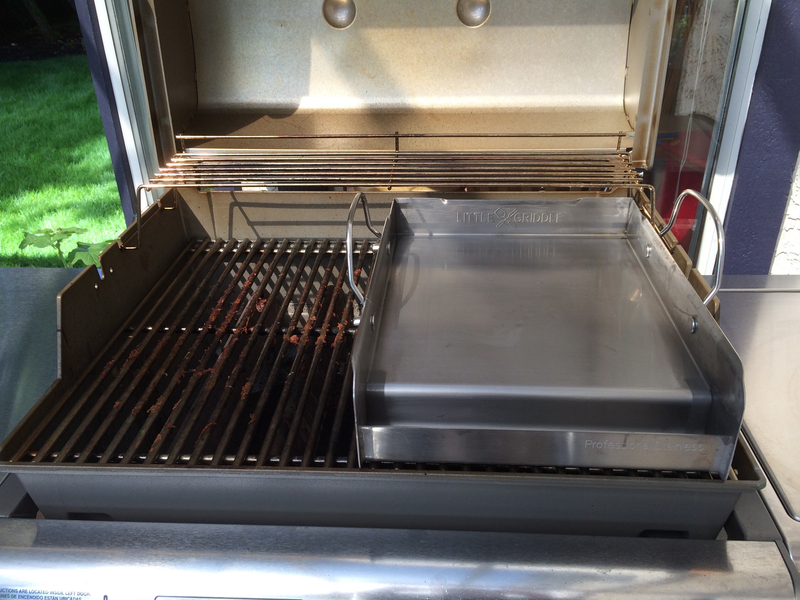 The griddle fits on the barbecue perfectly, and even with the handles it is possible to close the lid entirely if desired. One thing I immediately noticed was the pair of ‘crossover’ bars underneath the griddle: these distribute the heat evenly and also contribute to the solidity of the cookware. Bottom line- I like this griddle. It is serious overkill for me: to really deserve such a griddle, I should be making several gourmet meals a week. But when I use it, I feel slightly more competent. And it doesn’t punish me for my lack of cooking skill or knowledge. 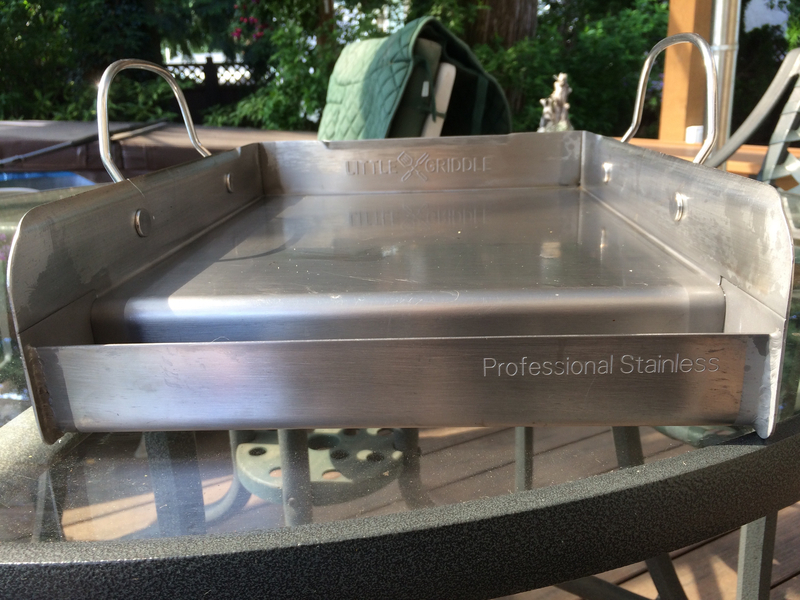 If you enjoy cooking on your barbecue, and ever wanted to cook some foods that just don’t work so well on the grill, I’d heartily recommend the Little Griddle Professional Series stainless steel BBQ griddle.